Rating the region: Second-toughest of the four, behind only the Midwest. If No. 3 seed LSU were more stable, you could make the case for this being the toughest. Duke is the overall No. 1 seed and Michigan State won both a share of the Big Ten regular season title and the tournament title. Contenders to cut down the nets in Washington D.C.: Duke and Michigan State seem head-and-shoulders above the rest. But give Virginia Tech a glimmer of hope after the return of guard Justin Robinson from injury. Pretenders who will be bounced early despite high seeds: LSU's athletes should overwhelm Yale in the first game — or the Tigers could look rudderless without coach Will Wade and be vulnerable to defeat. Even if LSU wins one game in this tourney, it may not win two and seems very unlikely to win three. Cinderellas: Belmont snuck in as an at-large team, just the second in the history of the Ohio Valley Conference and the first in 32 years. Now the Bruins could be a threat, with their spread-the-floor offensive concepts and shot-making capacity. If 6-foot-11 center Nick Muszynski returns from an ankle sprain suffered in the OVC tourney, Belmont could have the stuff to make a run. Team that doesn't belong: At No. 42 on the NCAA seed list, Temple was the third-lowest at-large team let into the field (only Arizona State and St. John's were lower). The Owls were just 2-6 against teams that made the tourney, with a controversial four-point home win over Houston and a five-point home win over Central Florida. All things considered, this feels like a retirement gift for outgoing coach Fran Dunphy. Chances of a 1-16 upset: No, Zion Williamson is not going to be eliminated by either North Carolina Central or North Dakota State. Best potential round-of-32 game: An LSU-Maryland game would bring the NBA scouts flocking to see Tigers freshman Naz Reid and Terrapins sophomore Bruno Fernando thump on each other in a battle of physical specimens. Best potential Sweet 16 game: The last time Virginia Tech and Duke played, on Feb. 26 in Blacksburg, Williamson was out for the Blue Devils and point guard Justin Robinson was out for the Hokies. They're both back now. Best potential regional final game: A Duke-Michigan State battle for the Final Four would be the best elite game of the tournament. Both teams have to feel a bit angry that they drew each other — the Spartans had a solid argument for a No. 1 seed and the Blue Devils are the overall No. 1. They shouldn't be meeting anywhere short of Minneapolis. Best coach: Mike Krzyzewski has won more of everything than any current coach, and the only coach in history who has him beaten in terms of titles is John Wooden. Underrated coach: With Saint Louis winning the Atlantic-10 tournament, Travis Ford is taking his third different school to the Big Dance after previously leading Eastern Kentucky and Oklahoma State. This is Ford's ninth season of 20 or more wins, and he's not yet 50 years old. Best player: Zion Williamson, Duke. You may have heard of him. Expect every single Blue Devils game to be slotted in primetime, even the opener against a No. 16 seed. Because Zion. Best player you've never heard of: UCF center Tacko Fall is more than just a novelty — although at 7-foot-6 and 310 pounds, he is that, too. Fall, who directs most of his shots downward through the rim, is making 75.4 percent of his field goals. 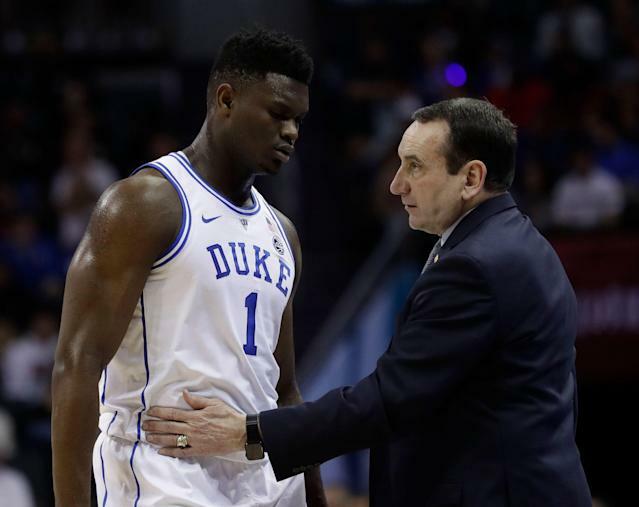 He could present an intriguing challenge to Duke in a potential second-round matchup: If Fall and the Knights can shut down the paint, the burden would be on the scatter-shooting Blue Devils to make perimeter shots. X-Factor: The selection committee dealt awkward hands to Louisville and Richard Pitino by matching the Cardinals with Minnesota in the first round — and in the very first game Thursday afternoon. Pitino, of course, is the son of once-beloved and now-disgraced Louisville coach Rick Pitino, and Richard served as an assistant to his father at Louisville on two separate occasions. Uncomfortable as the matchup may be, it does give Richard the chance to play Michael Corleone and settle all family business with the school that fired his dad. Welcome March sight: Multiple key players coming back from injuries in time for the tournament. Williamson returned for the ACC tourney and looks great. Robinson will play for Virginia Tech for the first time since January. Michigan State got back big man Nick Ward last week after a broken hand suffered Feb. 17. It remains to be seen whether Duke center Marques Bolden will make it back from a sprained knee for the NCAAs. Best part of this bracket: Mike Krzyzewski in the same pod with his first big Duke recruit, first great Duke player and his former assistant coach, Johnny Dawkins, now the coach at UCF.